JUST LET US KNOW YOU HAVE YOUNG CHILDREN WHEN SCHEDULING YOUR HOME INSPECTION AND WE WILL GLADLY INCLUDE A MONSTER FREE CERTIFICATE FOR THE LITTLE ONES. MOVING TO A NEW AND UNFAMILIAR PLACE CAN BE CHALLENGING . . . AND WE’RE ADULTS. WE UNDERSTAND THAT IT CAN BE JUST AS CHALLENGING FOR YOUR CHILDREN AS WELL. YOUR CHILDREN MAY SLEEP COMFORTABLY IN THEIR OWN BEDS, SECURE IN THEIR FAMILIAR SURROUNDINGS. A NEW HOME HOWEVER, WITH NEW SOUNDS AND NEW BUMPS IN THE NIGHT CAN LEAVE KIDS WONDERING WHAT KIND OF MONSTER IS UNDER THE BED! WE HAVE KIDS TOO, SO WE GET IT. THAT’S WHY WE ARE OFFERING THE MONSTER FREE GUARANTEE! PLEASE FEEL FREE TO BRING YOUR CHILDREN TO YOUR HOME INSPECTION. WE CAN INSPECT UNDER THE BEDS, UNDER THE STAIRS, IN THE CLOSETS, AND THE ATTICS, AND MAKE SURE THERE AREN’T ANY MONSTERS. 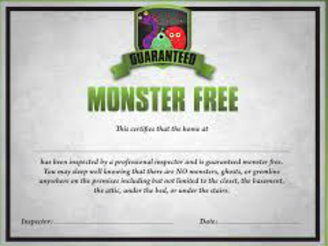 AS A "OFFICIAL MONSTER INSPECTORS" WE’LL GIVE YOUR CHILD A CERTIFICATE, AND REASSURE THEM THAT THEIR NEW HOME IS MONSTER FREE! SOMETIMES AS PARENTS WE NEED TO BE CREATIVE TO CALM OUR CHILDREN’S FEARS. THIS IS JUST ANOTHER WAY FOR US TO SERVE YOU AND YOUR FAMILY, AND WE HOPE IT HELPS YOUR CHILD MAKE THE TRANSITION FROM HOUSE TO HOME. ​proudly serving: Adams ny, Adams Center ny, Alexandria ny,Alexandria Bay ny , Antwerp ny, Black River ny ,Belelville ny, Brownville ny, Calcium ny, Cape Vincent ny, Carthage, Champion ny, Chaumont ny, Clayton ny, Deferiet ny, Depauville ny, Dexter ny, Ellisburg ny, Evans Mills ny, Felts Mills ny, Fineview ny, Fishers Landing ny, Fort Drum ny, Glen Park ny, Great Bend ny, Henderson ny, Herrings ny, Hounsfield ny, La Fargeville ny, LeRay ny, Lorraine ny, Lyme ny, Mannsville ny, Natural Bridge ny, Orleans ny, Pamelia ny, Philadelphia ny, Plessis ny, Redwood ny, Rodman ny, Rutland ny,Sackets Harbor ny, Theresa ny, Three Mile Bay ny, Watertown ny , Wellesley Island ny, West Carthage ny, Wilna ny, Worth ny, Lowville ny, Denmark ny, Oswego ny, Mexico ny, Pulaski ny, Pierrepont Manor ny, Baldwinsville ny, Constania ny, Clay ny, Liverpool ny, Gouverneur ny, Brewerton ny, Richland ny, Central Square ny, Sandy Creek ny, Hastings new york.